The Avebury "3D cubes" crop circle, July 28, 1999. This crop circle was made by the famous "CircleMakers", originally named "Team Satan", a team of graphic artists mostly from the London area. It was commissioned by the Daily Mail newspaper, who organized this demonstration to once again show how crop circle experts can be fooled [dm1]. The newspaper got permission from the farmer, Mr. Farthing, who received money in compensation. 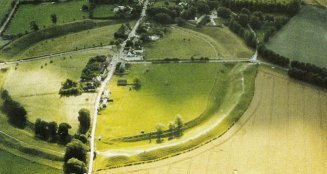 The field was at a popular and usual place for circle making, less than 200 feet from the Avebury stone circle, Wiltshire, U-K., on the side of Waden Hill, a place where the formation would be easily noticed the next day from places in the villages and from the touristy Avebury ring. Of course crop circles were being done there for more than a decade every year and it continued the following years. The three CircleMakers Rod Dickinson, John Lundberg, Will Russell, and 4 friends did the crop circle by night, under a full moon, in less than 6 hours. They started at 11:00 p.m. and were accompanied by a Daily Mail journalist nicknamed "Samantha Taylor"  and a newspaper photographer nicknamed "Nick Holt". They left the place at 04:30 at dawn. The diameter of the formation was 300 feet. The Avebury "3D cubes" crop circle. The Daily Mail newspaper interviewed the locals and the curious, asking them who they thought did this, and many said that no human being could have done this crop circle, that if human had tried to do it, they would have been seen. Two weeks later, on the sensationalistic Art Bell radio show in the US, on August 15, 1999, "Crop circle expert" Chad Deetken  claimed to interviewer Linda Moulton-Howe, that he and his wife were at "1000 feet at most" of the place, at least from 00:30 a.m. to 01:30 a.m. and saw no crop circle nor anything suspicious. Other claims  that "people there saw nothing" were made and Moulton-Howe and horror-books author and self-claimed "abductee" Whitley Strieber then denied that the circle was made by the CircleMakers men, calling this a "patently false story". However, in a later article on the web, Deetken now said that all except him and his wife had left at 11:00 p.m. and that they walked the "Avebury Avenue" and "meditated", to leave "at 12:30 a.m.". [cd1] Deetken did not grasp that such sites are simply popular to crop circle makers just because of the paranormal nonsensical beliefs attached to ancient sites and he rather believes that there are "Earth energies" at such ancient sites and that crop circles are "related" with such "Earth energies"; which he claims to detect by dowsing. And Deekten then claimed that when he visited the circle he immediately thought it was "a mess" and that his opinion was confirmed when the Daily Mail revealed that it was done by the CircleMakers. But only to change his mind a few paragraphs further! Crop circle "expert" Lucy Pringle claims the crop circle had not been made by men, with the reason that the places are never deserted because "Visitors and locals mingle with the stones and walk through the lanes all night long.") [lp1]. Alas this claim contradicts that of Chad Deetken who said that the places were deserted ("We arrived at 10 PM and found the site deserted") [cm1]. No investigation was carried out, the "experts" being satisfied with what looks like hearsay and general speculations about crop circles; no location maps, no localization of people saying they were there, none of the infamous "samples" and "research" on plants anomalies, or so-called "radioactivity" or "UFO sightings". Nobody says a word about looking for clues of human realizations, no search for hidden paths for example. In his book "Anatomy of a Deception", self-proclaimed crop circle "expert" Fred Silva used a distorted picture of the formation and claimed it proves it was "a hoax", i.e. made by men, because "the geometry was flawed", that it was "inferior work" and "without meaning". German crop circles book authors Werner Anderhüb and Hans Peter Roth on the contrary cite the formation as a hoax by Team Satan commissioned by the Daily Mail, and also argue that the realization is "messy" [ar1]. It was not the first time the Daily Mail fooled crop circles experts by commissioning a crop circle. Their reporters were usually then assaulted by phone calls and home visits by cranks and "crop circles experts" trying to make them admit their alien or paranormal crop circles theories. This is why the reporters then used nicknames. Some "experts" who could not grasp that the reporters were tired of the harassment in their privacy used nicknamed argued that as people such as "Sam Taylor" do not exist, the newspaper lied and the crop circle is therefore "authentic". Crop circle "expert" Lucy Pringle said it was "Gwen Chad and her husband Chad", but it was Gwen Deetken and her husband Chad Deetken. One Clive Gale, is also said to have passed "through Avebury" that night and noted no men doing a crop circles; however, the "experts" give only "in the early hours that night" as time, whereas the circle making started much later. [dm1] "The Night Those UFO's didn't Land", article in the Daily Mail newspaper, London, U-K., August 7, 1999. [mg1] Sussex Circular, bulletin of the "Centre for Crop Circle Studies" (Sussex Branch), #86. [ar1] Das Geheimnisse der Kornkreise, book by Werner Anderhüb and Hans Peter Roth, AT Verlag, Germany, page 103, 2000. [ar1] "Le Mystère des Crop Circles", book by Werner Anderhüb and Hans Peter Roth, French version of "Das Geheimnisse der Kornkreise", Véga publishers, France, page 148, 2003.